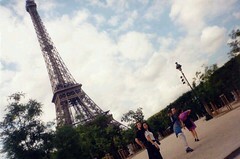 3 Parisian Things -- Let's have it ! 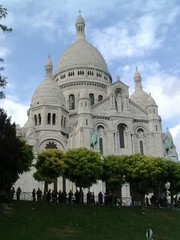 The church (Basilique, in fact) of the Sacré Coeur in Montmartre. It’s quite a climb through streets aptly named things like Rue du Calvaire, roughly translated as “time of hardship street” in common parlance. You can get a cog-wheeled railway which mounts a steep incline instead, called the funiculaire. Recommended if you want a bit of energy to check out the nearby square where artists paint caricatures or portraits and coffee is ridiculously expensive. Maybe check out the Espace Dali if you’re into a small, hidden away museum with all things Dali. Built for the Paris exhibition in 1889 it was originally intended to be taken down. Somehow the phallic tower remained – and is visible rising up into the sky, or hiding behind a skyscraper and suddenly leaping out again – from many places all over Paris and visible from a vantage point less than 5 minutes from where I live, especially on a clear day. Nothing quite like it (except the copies in Vegas and the like) anywhere else. The Champ de Mars, the park upon which it stands on the north west edge, is a pleasant place to become a flâneur with a sandwich and a cool drink. Watch out for hawkers though, they’re everywhere. In a big square in the Beauborg area of Paris, not far from the Halles shopping centre with the Hotel de Ville not far in the other direction (though slightly more south) the Centre Pompidou is a good place to check out if only for the curious inside-out architecture, though the collections inside are good. Look out for special shows, seen a couple of cool ones there. You can hang out in the many bars and cafés in the area, and don’t miss a curious bunch of colourful sculptures giving an endless loop of a water performance which can be watched from a terrace of the closest café. 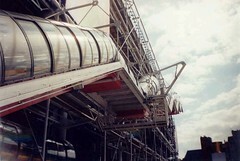 This entry was posted on Monday, March 28th, 2011 at 10:45 am and is filed under France, general, photography. You can follow any responses to this entry through the RSS 2.0 feed. You can leave a response, or trackback from your own site. I enjoyed the tour. Though there is lots more to see and I hope that you’ll do more posts like this. Brings back happy memories of a very romantic weekend.. ahem…27 years ago. Was a rather nostalgic series really, since the photos are all from around 10 years ago (around about 2000-2001). Will have to go and take some of other places, or dig around my archives a bit more. What is the best thing to come out of Wales?